How is MKF working to prevent child abuse? Missouri KidsFirst believes in utilizing research-informed practices and evidence based programs to prevent child abuse and neglect in Missouri. We do this by using the CDC’s Essentials for Childhood, the CDC’s technical package to prevent child abuse and neglect, and the Center for the Study of Social Policy’s Strengthening Families/Protective Factors framework to help guide us in building the comprehensive foundation of safe, stable, nurturing relationships and environments in our state that all children and families need to thrive. We work with individuals, communities and state wide leaders to help create the healthy cultural context for all adults to understand the importance of preventing child abuse and neglect. We advocate for policies that increase family strengths, enhance child development and reduce the likelihood of child abuse and neglect. We train adults, youth serving professionals, and community members to gain the critical child protection skills needed to prevent child abuse and neglect from ever happening, as well as strengthening interventions and responses when child abuse and neglect does occur to prevent further abuse. Pinwheels for Prevention Program: Missouri KidsFirst (Prevent Child Abuse Missouri) leads child abuse prevention month activities in April with the Pinwheels for Prevention awareness campaign. The Pinwheel has come to represent the happy, healthy childhoods we want for all of our children. Throughout April, planting pinwheel gardens in honor of children in communities throughout our state demonstrates how we can all support great childhoods and promote ways to help great childhoods happen. The more we can show people how simple actions relate back to child abuse prevention, the better people will understand what prevention is in the first place, and the greater the chance that adults will take action to protect children in their lives. We provide assistance to others committed to preventing child abuse and neglect by providing resources, education and technical assistance for the Pinwheels for Prevention campaign. Child Sexual Abuse Prevention Program: Darkness to Light’s Stewards of Children® Missouri KidsFirst (Prevent Child Abuse Missouri) leads the Missouri Stewards of Children Initiative and the Missouri Stewards of Children Facilitator Network. Since 2008, Missouri KidsFirst has been committed to training adults in the Stewards of Children® child sexual abuse prevention training. We passionately believe in the Stewards of Children® training because it is the only nationally available, community based, evidence informed training where training participants have consistently demonstrated increased knowledge, improved attitudes and, most importantly, positive changes in child-protective behaviors. At Missouri KidsFirst, we believe there is a “tipping point”, a point at which momentum is unstoppable and a cultural shift occurs to protect every child from sexual abuse. In order to reach that tipping point in our state, we have a goal of training at least 5% of Missouri’s adult population. We also train and support Missouri’s Network of Stewards of Children® Facilitators. The Network was established to prevent child sexual abuse by provide a supportive environment where statewide Stewards of Children facilitators can collaborate, share experiences, skills and passion for protecting children. 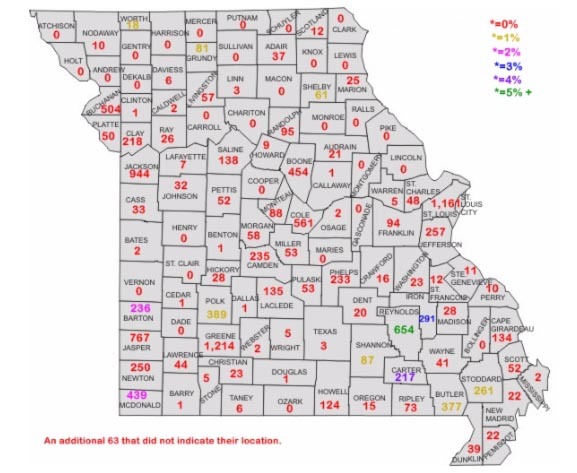 The Network is the foundation that will ignite a statewide prevention effort and help us train 5% of the adult population in Missouri; therefore, reaching the “Tipping Point” (illustrated in the map below) needed to create social change around child protective behaviors. Our Vision: Every child is safe from sexual abuse, because every adult knows how to protect all children. Our Mission: To empower, encourage and coordinate our facilitators to arm adults with the skills and tools necessary to protect all children from sexual abuse. Help us reach the tipping point and our goal of training 10,000 more adults by 2020! Contact the Regional Facilitator serving your community to get involved in Missouri’s Sexual Abuse Prevention Initiative. For more information, contact Missouri KidsFirst’s Emma Overschmidt (emma@missourikidsfirst.org) or Annie Wilson (annie@missourikidsfirst.org) or call us (573) 632-4600 to schedule a free training in your community! Although we would like to prevent child abuse and neglect from ever occurring, we believe that adults must also be educated and empowered to recognize and react responsibly to child abuse. Missouri KidsFirst manages Missouri’s Child Abuse and Neglect, Mandated Reporter Training (free and online). We also provide in person mandated training to organizations for a fee.